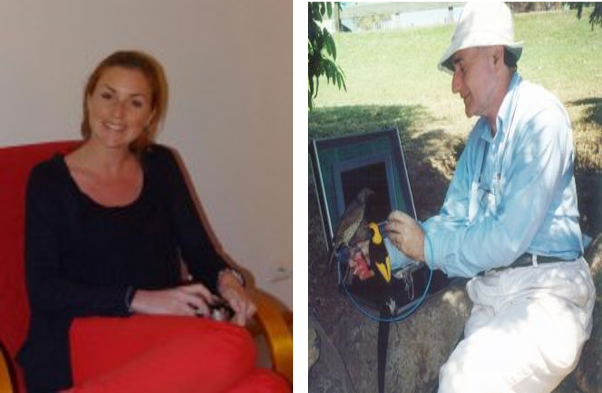 Gemma C. & John E.
Brief summary of the paper: The appearance of animal colour signals depends jointly upon the ambient light spectrum and the signal’s reflectance spectra. Light environment heterogeneity might, therefore, allow individuals to enhance their signal by signalling in an environment that increases signal efficacy. We tested this hypothesis by providing male guppies (Poecilia reticulata), a choice of three light environments in which to display their colour signal to females: green, lilac, and clear. We paired males with both receptive and non-receptive females to test whether female response might affect male behavioural decisions. Males preferred the clear environment in all trials and this environment also resulted in males having the highest average visual contrast. Sexual behaviour was influenced by complex interactions between female receptivity, light environment, and male colour pattern contrast. Males spent significantly more time in the environment in which their colour signal had the highest contrast, but only when paired with receptive females. Significant interactions between light environment and individual male colour components were also seen only in receptive trials. Our results suggest that males use light environment to enhance their colour pattern, but only in the presence of receptive females.